Gustav Klimt and the mystery of the burnt pictures. 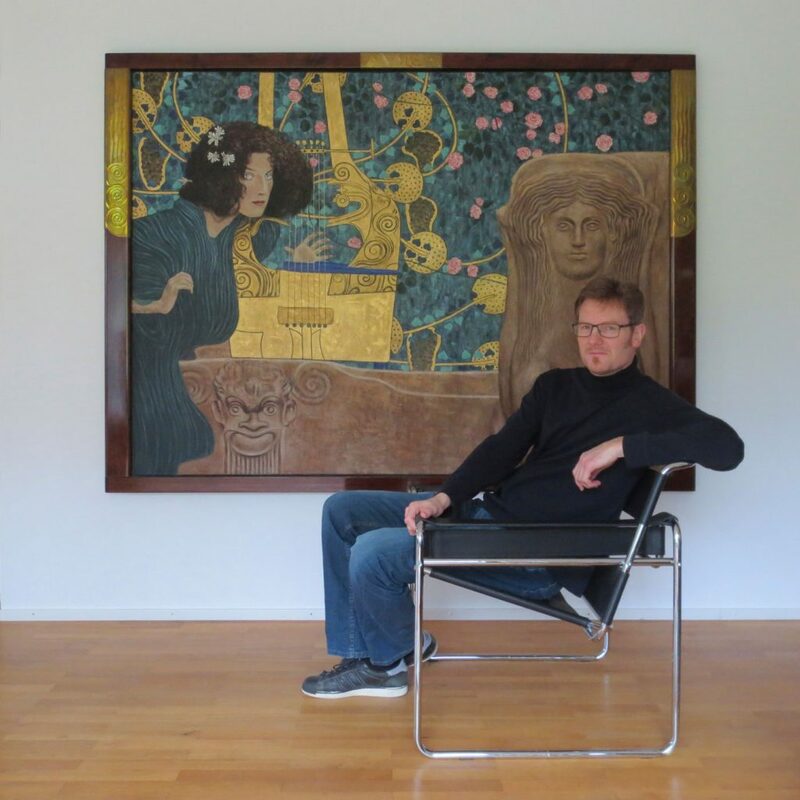 How one comes to reconstruct a lost painting by Gustav Klimt and why it is important to preserve cultural heritage explains Thomas Michel in an interview with the project space Phasis. The year 2018 is celebrated as an exceptional art year in Vienna. What is the reason for the multitude of exhibitions that are focused on the subjects of Secession and Art Nouveau? One hundred years ago in 1918 four personalities died who were of great importance for the art and culture of Austria, thus marking the end of a period. The death of the painters Gustav Klimt and Egon Schiele, the architect Otto Wagner and the allround artist Koloman Moser meant the end of the Fin de Siècle in Austria. And what is your contribution as an artist to this anniversary year exactly? On the occasion of the 100th anniversary of the death of Gustav Klimt I want to give the art world one of his works back that are supposed to be burnt in 1945 on the last day of the Second World War. It’s the picture Music II, an overdoor that hung in the villa of Nikolaus Dumba. How did you come across this picture and its story? In all illustrated books and catalogues raisonnés about Gustav Klimt some of his main works are displayed only as poor black-and-white photographs, among them the famous Faculty Paintings. They are the paintings that belonged to the collection Lederer. The industrialist family Lederer were the greatest patrons of Gustav Klimt and Egon Schiele, in 1939 they were dispossessed by the National Socialists, the large collection was seized and stored on various locations. For the protection against air raids the inventory of the collection Lederer and other pictures by Gustav Klimt were taken to Immendorf Castle in Lower Austria. Immendorf Castle was chosen, as it was strategically negligible and therefore considered as ideal for the protection of works of art. And what happened to the pictures on the last day of the war? The generally accepted version of the story says that withdrawing SS troups had booby-trapped Immendorf Castle and detonated the building to prevent the works of art from falling into the hands of the Red Army. Scorched earth policy. And all pictures by Gustav Klimt burnt? This is the prevailing opinion in art history and in documentations about the work of Gustav Klimt. But there are inconsistencies. Supposedly there were 16 lost paintings by Gustav Klimt stored at Immendorf Castle, but only 10 pictures from the collection Lederer were taken there, however, all pictures are listed as burnt. Also the timer of the booby traps is said to have detonated three hours after the Red Army had occupied the castle. Eye witnesses reported of lootings already before the end of the war and between 1943 and 1945 transports left Immendorf Castle regularly. This means that the pictures could have been stolen already during the war before the fire and be taken to a secret place? At least it cannot be excluded. The case is very much reminiscent of the story of the works of art from the Berlin Gemaeldegalerie, which are supposed to be burnt in the Flakbunker Friedrichshain. Also here there are a lot of contradictions. It is absolutely imaginable that Americans or Russians have looted the depot and the fire just was meant to cover up the art theft. And maybe these images are stored now in any secret art depot in the USA or in Russia? Of course the hope that the works of art still exist fires the imagination of art lovers. If one thinks of all the works by Botticelli that have gone lost. The irony of the story is that the Berlin Gemaeldegalerie still possesses the frame of the large tondo by Botticelli Virgin and child with angels carrying candlesticks which was designed by Schinkel, as it wasn’t considered valuable enough to be taken to the Flakbunker. The empty frame is just depressing. Just like the black-and-white reproductions of Gustav Klimt’s main works. Absolutely! They have depressed me so much that I have decided to reconstruct one of these images. In addition it was an artistic challenge for me. 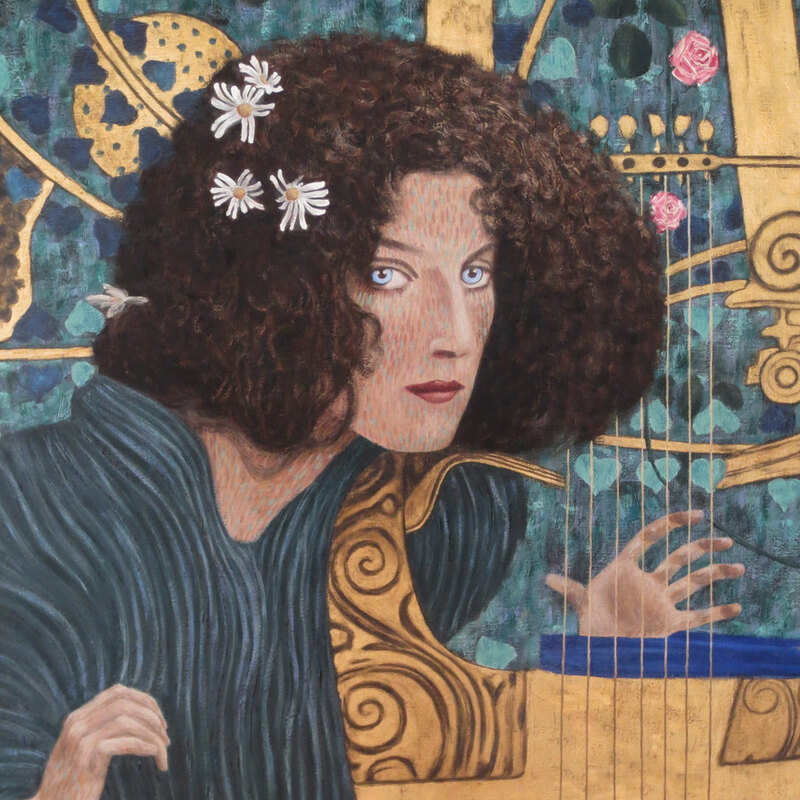 Music II by Gustav Klimt represents the music competition between Pan and Apollo. Why did you choose Music II? For me this picture embodies the art of painting by Gustav Klimt, even more than its counterpart in the music salon of Nikolaus Dumba Schubert at the Piano which has been lost as well. On the one hand it’s Gustav Klimt’s type of woman represented by the femme fatale with her subtle eroticism and subliminal melancholy he captures the mood of the fin de siècle with and gets to the heart of it. On the other hand it’s the ornamentation of the picture plane, the combination of ornament and abstract natural forms. The allegory of music was commissioned by the industrialist Nikolaus Dumba. Nikolaus Dumba was a patron and philanthropist in Vienna towards the end of the 19th century as they cannot be found today anymore unfortunately. Music II was part of a total work of art merging painting, architecture and music and adorned the music salon of his villa together with the picture Schubert at the Piano. The synaesthetical approach, the combination of art and music always has fascinated me, especially as it is virtually lost today. For Mussorgsky’s Pictures at an Exhibition I once have created a picture series. Which motifs did Gustav Klimt use in the composition of the allegory of music, how can the image be interpreted? 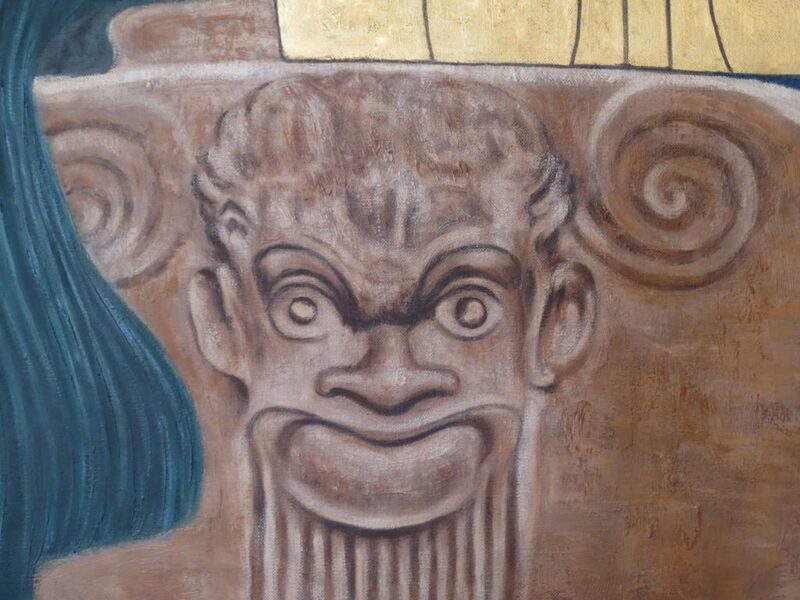 Iconographically the image follows examples in the area of ancient vase painting. Especially the shape of the kithara and the vine branches with the grapes hanging down are inspired by the ancient world, in Greece they represented the dualism between the Apollonian and the Dionysian. The round shapes could be interpreted as symbols of fertility, but are also suggested as sacrificial offerings for the Dionysus cult. The allegory of music is embodied by the female figure, with the grotesque face reminding of Pan representing the Dionysian ecstatic aspect of music, whereas the sphinx stands for its ambivalent, rationally unfathomable character. How was your approach to the reconstruction? Such a project certainly requires a lot of preliminary work. Music II was also suitable as reconstruction project as a small draft design of it is hanging in the Neue Pinakothek in Munich which helped me to get an impression of which colours Gustav Klimt probably used for the overdoor. I started with copying this small version of the allegory of music, along with other pictures by Gustav Klimt. Thus I got a feel for his technique and his application of paint. What is so special about his technique? It’s the pointillist application of paint. By applying mostly vertical short dotted brush strokes in complementary colours Gustav Klimt makes the colour vibrate. Gustav Klimt is a popular painter to be copied. Which experiences and which technical knowledge is required to be able to realize such a project? First of all one should know how the paint layers of a painting are organized. Painting is primarily handcraft. And above all one cannot paint a work by Klimt wet-in-wet in one go, otherwise the result will look like 99 percent of all the other Klimt copies. In the meantime painting has become hip again, but in the eighties this used to be completely different. Where did you learn this craft? In the museums of Munich. The collection of old masters in the Alte Pinakothek and of the 19th century in the Neue Pinakothek are outstanding. One just has to look closely, there are no better teachers if one wants to learn the craft of painting. That’s why I’m a self-taught painter. This means, you have never studied at an art academy? No. At the end of the eighties painting was absolutely frowned upon, then politically correct conceptual art was promoted. The documenta X was expression of this hostile mindset towards art, for me this was a bad decade as I have always been interested in painting. But an academy was out of the question for me, what could I have learnt there? Definitely not how to make gesso or which resin is the most appropriate one to add to the oil paints. Is this still necessary to know nowadays in view of the product range offered by the paint industry? Unfortunately the knowledge of the old masters has been passed on only by word of mouth except for a few exceptions like the Tractate on Painting by Leonardo da Vinci, they knew exactly how they could light the colours through the right order of opaque paint layers and glazes. An oil painting is comparable to an epidermis out of several skin layers. Only if one has understood the principle of this layering, one can make the blood flow through the veins of a painting, so to speak. Unfortunately this knowledge has been lost more and more until the 19th century and when the paint tube was invented is was dead. And how did you reconstruct Music II in practice? Which technical knowledge is it based on? I’ve tried to follow the principles of the old masters as far as possible. An old painters rule says “fat over lean”. 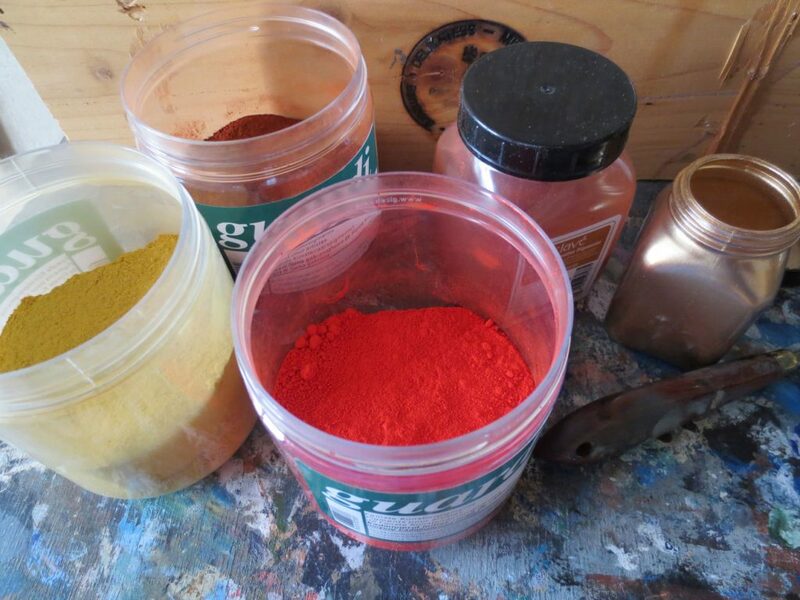 This means that paint with a higher oil to pigment ratio is applied at the end to ensure a stable paint film. At first I glued the canvas with rabbit-skin glue and then I primed it with gesso. The preparatory drawing was followed by a tempera layer, which was covered by an imprimitura of resin varnish, finally I applied the layers of oil paint. What’s the sense of reconstructing works of art that never can replace the original? Primarily I’ve painted the image for myself. It has depressed me and made me terribly angry that I couldn’t get an impression anymore of how the original of Music II by Gustav Klimt may have looked. Only because a mob of dumb brown morons wanted to take revenge on posterity for their military defeat by erasing the most important works of Gustav Klimt. I just wanted to be able to stand in front of this picture and admire it in its full size and ornamental splendor. Some undertakings simply require a certain degree of craziness. How did you research on the reconstruction? Your version of Music II is a little bit larger than the reproductions of the original by Gustav Klimt. When I reconstructed the picture there was no internet yet. I couldn’t just google to get certain information, I had to rely on the information that was available in illustrated books about Gustav Klimt. There the image size was specified to be 150 x 200 cm. However, if one measures the proportions of the preserved black-and-white photographs, one doesn’t obtain the width-to-height ratio of four to three. Something had to be wrong with the specifications, either the measurements were wrong or the photograph was cut. 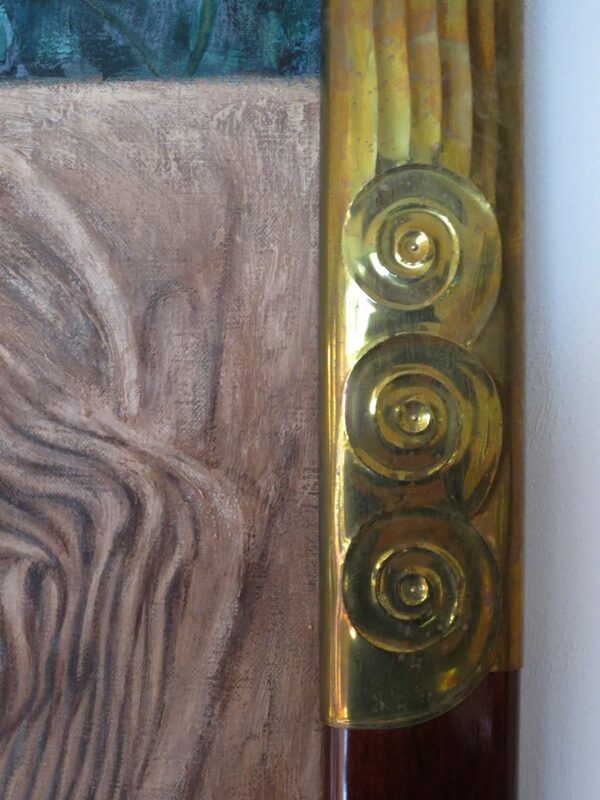 On the right side of the photograph there is always a piece of Gustav Klimt’s signature missing and the female figure on the left side as well as the ornaments behind her appear somehow squeezed into the picture format. Therefore I suppose that on the left and the right side a strip of the painting is missing on the reproduction, which in turn results in the fact that also a piece of the upper picture area must be missing to obtain a width-to-height ratio of four to three. Are there existing any photos of how Music II was presented in the villa of Nikolaus Dumba? Yes, as overdoor Music II was installed in an architectural frame above the door of the music salon that has probably covered more of the image than a common picture frame. Therefore I have amended the ornaments and blossoms in the upper picture area, now the composition with the allegory of music has space to breathe again. Can you tell something about the frame the reconstruction is presented in now? Now Music II is of course no overdoor anymore, but it’s a given that a painting by Gustav Klimt requires an appropriate Art Nouveau frame. Klimt often had designed his frames with the typical Art Nouveau ornaments himself. Therefore I have designed the frame in the Art Nouveau style and got inspired by the frame of Gustav Klimt’s picture Judith. Did you build the frame yourself as well? 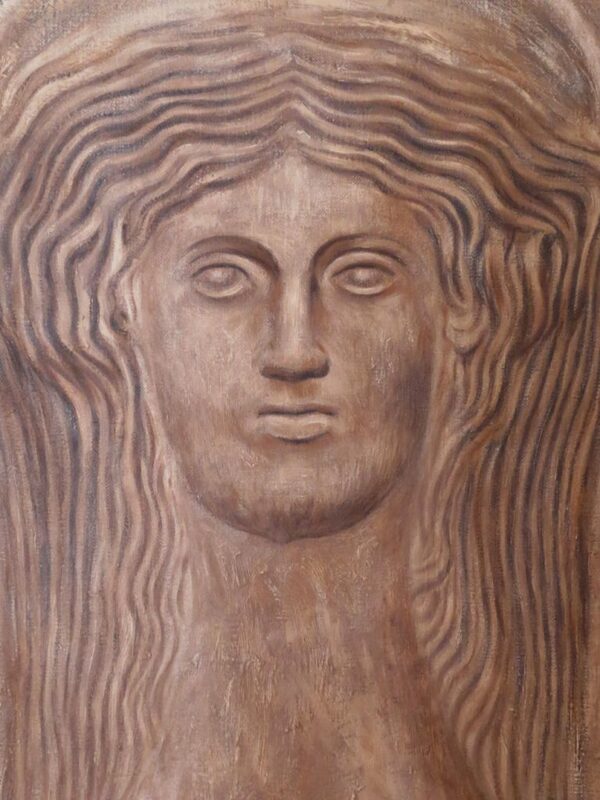 Yes, I got the profiles manufactured, afterwards I stained the wood in a mahogany colour and applied shellac. The application and burnishing of the innumerable layers of shellac was the most laborious part of the project and was more time-consuming than the painting. Subsequently I manufactured the brass fittings. About the deeper meaning of constructing a painting by Gustav Klimt. Such a kind of project sounds like an enormous amount of work and even more craziness. What’s the meaning of investing so much energy in the reconstruction of works of art? Surely a reconstruction cannot replace the original and it always bears a certain degree of interpretation and signature of the artist accomplishing the reconstruction, but I consider it as important to keep the memory of these works and especially their story alive. A good reconstruction can affect you as it causes the ambivalent feeling of relishing art and grief about the loss of the original at the same time. The direct confrontation with the loss of a work of art can be much more striking than an art historical documentation. But doesn’t this kind of art experience remind of Disneyland? When some day everyday life will return to Syria and the blasted ruins of Palmyra will be reconstructed, is this then Disneyland as well? I see this completely different. A reconstruction is about preserving a cultural heritage, not about cheap showmanship. Culture always means identity as well, exactly this is what the IS attempted to erase by destroying Palmyra, and Hitler’s Nero Decree was going in a similar direction. To keep the collective memory alive is the essential purpose of culture. Also Germany is captured by a true wave of reconstruction, in Berlin, Potsdam, Dresden and Frankfurt buildings that have been destroyed in the Second World War are rebuilt at great expense. Just as well one could make a statement by means of contemporary architecture. The retro trend that has caused the reconstruction wave has psychological reasons and in the end it has to do with identity again. After the Second World War in many German cities there was the intention to start from a blank slate, war ruins which could have been rebuilt were blasted for ideological reasons also in the Western part to make room for modern architecture. Many urban planners saw it as a once-in-a-lifetime opportunity to get rid of outdated architecture. But from today’s perspective one has to state that the architecture of the 20th century didn’t make use of the opportunity to enhance the urban quality of the cities. The architecture of the modernist era didn’t find the right answers to the problems of urban development in the 20th century. Of course also because building projects are trapped in a political and capitalist system that generally drives mediocrity. The people are fed up with contemporary uniform architecture out-of-the-box, they are longing for individual architecture of urban quality they can identify with. 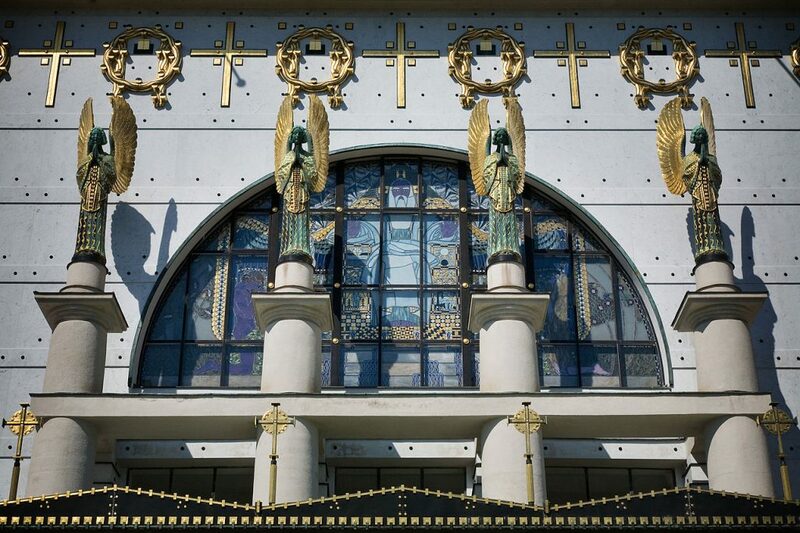 But also the buildings by Otto Wagner once represented modern architecture that was criticized by contemporaries. One shouldn’t play off the possibility of reconstructions against contemporary architecture. Both have their justification, but the location is the essential criterion. When a brutalist concrete monster from the 1960s in pulled down in Frankfurt and the historic centre with the coronation path of the German kings and Emperors is reconstructed instead, partly using spolia, this has nothing to do with Disneyland, but it helps to give the city her identity and her soul back. 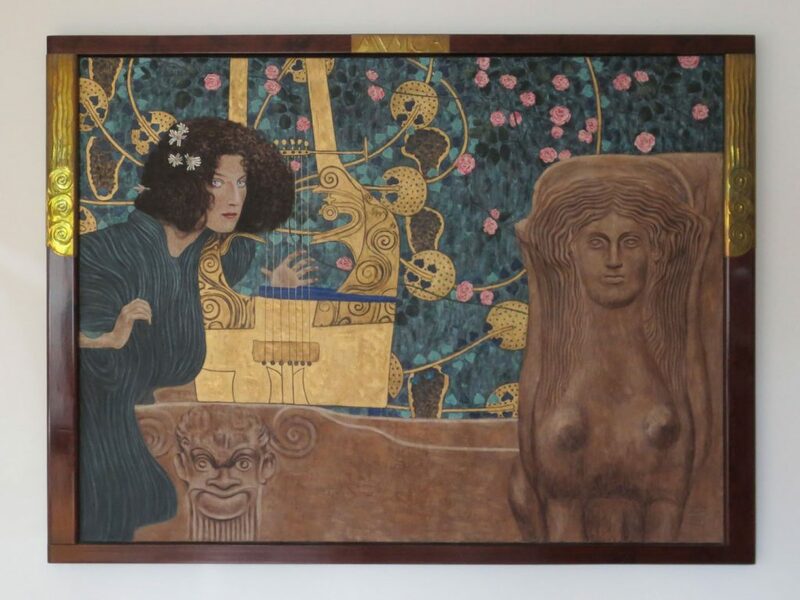 What connects you with Gustav Klimt respectively Art Nouveau that you were willing to invest so much time and energy in this project? Then I wasn’t conscious of the reasons and why I feel connected to the art of the Fin de Siècle. Only later did it become clear to me that it must have to do with childhood memories. 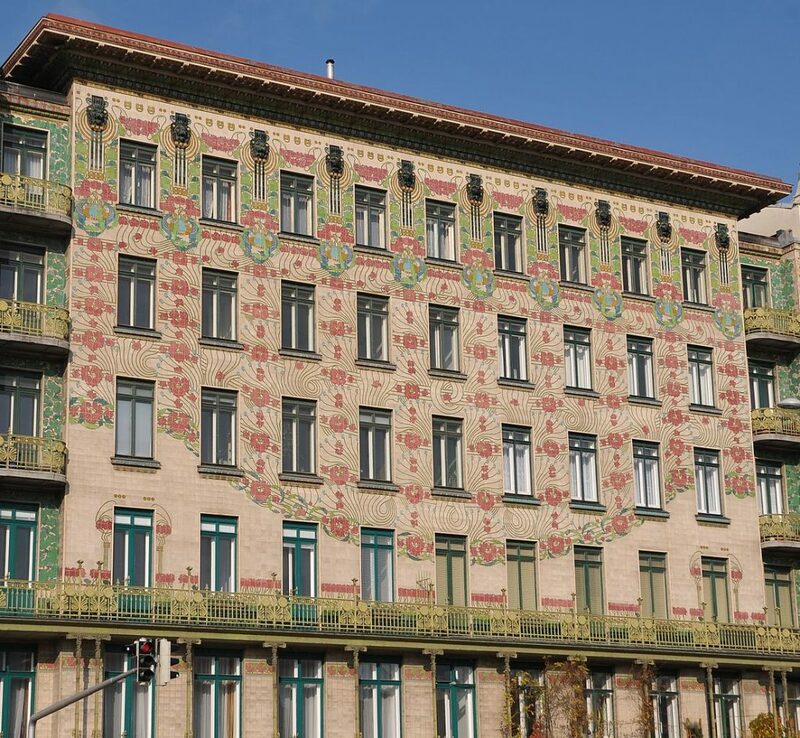 Joseph Maria Olbrich who had designed the Vienna Secession also built the Art Nouveau ensemble of the Mathildenhoehe in Darmstadt with its Wedding Tower and the houses of the artists’ colony. When I was a child I often was in Darmstadt to visit my grandparents, therefore I knew the Mathildenhoehe which must have left a deep impression on my artistic perception subconsciously. Why is Gustav Klimt so popular still today, what’s the reason for the fascination of the Art Nouveau movement? From an art historic point of view Art Nouveau is the link between the 19th century and the modernist era, it represents a time of transition between two periods. The deep understanding of nature that characterized Romanticism is still alive, while the modern age with the industrial revolution and the straight lines of functionalism already starts to dawn. It’s a sense of impending change in combination with fear of loss that is reflected in the melancholic prevailing mood of the Fin de Siècle. The art of Gustav Klimt is so popular because he belongs to the modern era and the Belle Èpoque that is so mystified today at the same time. Art Nouveau was the last artistic movement that included all genres of art, painting, sculpture, illustration, architecture and design. It was the last flaring up of a synaesthetic world view before everything perished in the roar of guns of the First World War and split up into various styles. Art Nouveau has suffused the very last corner of everyday life and turned every object into a projection screen of an aesthetic world view. In this context the achievements of the Wiener Werkstaette and its influence on modernism cannot be appreciated highly enough. Both in its design approach and educational mission the Wiener Werkstaette laid the foundation for the Bauhaus which brought the aesthetics of functionalism to perfection. Ornament and Crime. Gustav Klimt was one of the last of his kind. But at the expense of ornamentation as Gustav Klimt has used it in his images. The meaning of the ornament wasn’t understood anymore in the modern age and was confounded with decoration. In his pamphlet Ornament and Crime Adolf Loos crusaded against the ornament which had a strong influence of the modern reduced design of functionalism. Subsequently the Bauhaus has done away with the last remnants of ornamentation. The form of the object itself has taken over the function of the ornament in the modern era. But one shouldn’t forget that the ornament also had a psychological function. Human perception follows geometric basic forms that have to appear complex enough to be perceived as aesthetically relevant. As a symbol the ornament was inseparably connected to its object and couldn’t be simply exchanged like a decorative transfer picture. Often the ornament was inspired by abstract natural shapes, today in the 21st century we have arrived at the point that architects, designers and scientists in the area of bionics get inspired by nature again to look for functional and constructional solutions that always have been existing in nature. You are working also as a designer. What’s the difference in the creative process between art and design? 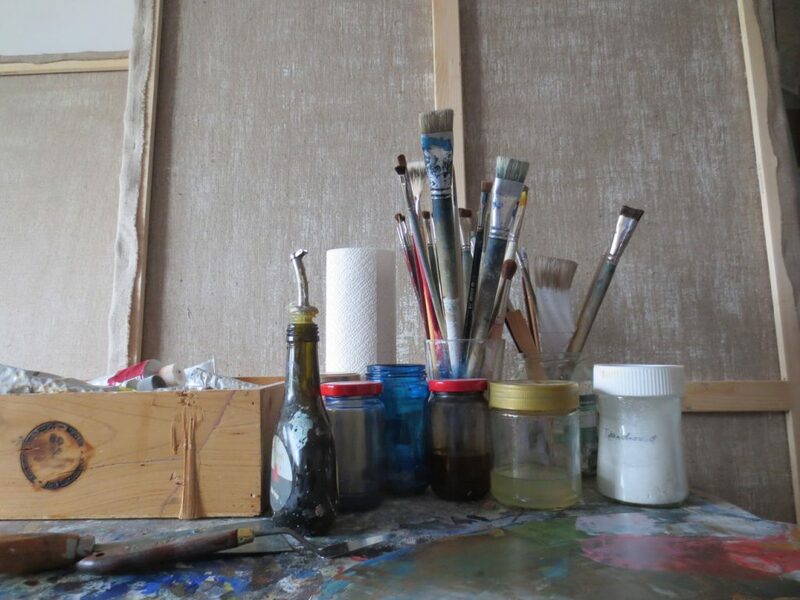 The main difference is that in art you are working only for a fictitious anonymous buyer and you have absolute freedom of decision during the working process. This is both a blessing and a curse. In design you always work for a certain customer who has a say. A design project requires willingness to compromise and teamwork capability which is an asset many artists are lacking. Why is creative freedom both a blessing and a curse? In art you are always working on your own and have to make decisions by yourself, there is nobody who can show you a different point of view or warns you when you get on the wrong track. Artists tend to self-infatuation and to romanticizing their own work. Often they are satisfied with easy solutions because the counterpart is missing who demands more. In design, however, there are no easy solutions, due to functional and economical restrictions one is constantly forced to question the creative process. With regard to contemporary art I’m often asking myself if I would have been satisfied with the presented result. Both in conceptional and technical regard. To reconstruct lost pictures by Gustav Klimt surely isn’t the only thing that you are doing as an artist. No. Such projects just serve the purpose to improve one’s skills. It sounds old-fashioned, but also in the past copying was practiced at the academies, there is no better way to learn how to paint. There are artists who reject this technical approach as creative constraint, but that’s the ones who are satisfied with easy solutions. If I don’t have a technical basis I cannot abstract from it later on or question it. This is the case in any profession, only in contemporary art there is this arrogant attitude that one can do without this and to indulge in one’s own genius cult, just because there is no objective indicator of quality. How do you see the contemporary art market with its staggering price records? Contemporary art is a market for oligarchs where the beneficiaries and minions of autocratic systems or the profiteers of the financial industry outbid each other from vanity to purchase complacent decorative objects as capital investment. They represent exactly the opposite of patrons such as Nikolaus Dumba or August Lederer without whose commitment Gustav Klimt or Egon Schiele wouldn’t have existed. I don’t speculate for this bubble to burst some day, as before the entire neoliberal system would have to collapse. Apart from that I consider it as legitimate to rob these educationally deprived elites blind with pseudo art. Just like Damian Hirst is doing it? Exactly! He is clever in having articles produced which address the intellectual level of their target group. The only sad thing is that he is confounding this with art and still believes that he is a great artist, but who has become part of this money-grabbing system long ago. His Treasures from the Wreck of the Unbelievable are a kind of a fictitious reconstruction as well, but this is truly Disneyland. What a gigantic effort for a heap of intellectual trash. Dawn of ages. What our period has in common with the era of Gustav Klimt. If an artist is anxious to defy this system, what is the purpose of art nowadays? Art has to reach the people again and has to become socially relevant, and above all it has to abandon monumentality. This is achievable only if art tackles uncomfortable topics, but without dealing with everyday politics. One has to speak out openly, especially painting I see as a visual tool to teach the people again how seeing works, how to distinguish true from fake. We are living in a permanent state of crisis, in a transition time between two periods, just like Gustav Klimt one hundred years ago. The rapid change frightens the people, that’s why more and more right-wing governments come into power throughout the world. The nationalists are the camp of the fearful. Every intelligent person has to raise the voice of reason against this development and also art has to contribute to this. How is your art influenced by current affairs? My pictures have become more political in the recent years without having this intended. My last exhibition Doublethink is about the disintegration of certainties in modern society where the borderline between truth and lie is deliberately blurred through the social media. Gustav Klimt and the aesthetics of the artists of the Secession actually don’t play a role for my own work, I rather feel connected to the mindset of surrealism which has taken the unfathomable of the Fin de Siècle and Art Nouveau to the modernist era. One could say that Sigmund Freud was the historic link between the period of Gustav Klimt and surrealism. German romanticism, symbolism and surrealism follow the same pan-European artistic development direction. The kitsch, however, that is produced today by people who call upon surrealism, has absolutely nothing to do with the philosophy as André Breton has formulated it. As surrealism rather is an attitude towards life which is related to Zen-Buddhism. Would you call your pictures surrealist? No, this sounds too historic. But they follow this spiritual tradition which has already started in the Renaissance and has developed through romanticism in Germany and surrealism in France. Next to painting you also work in a technique which you call hydrography. What kind of technique is this? I stumbled upon it by chance when I experimented with ink. It’s a mixture of painting, automatic drawing in a surrealist sense and medial picture process. Through sedimentation of ink pigments on foil tiny images are generated, similar to a photographic negative that serves as a starting point for the making of prints. The images are strongly influenced by chance and reflect growth and transformation processes in nature, a synthesis of micro- and macrocosm. I called it hydrography because it visualizes the forces of the liquid state of aggregation. Which projects do you plan for the future? 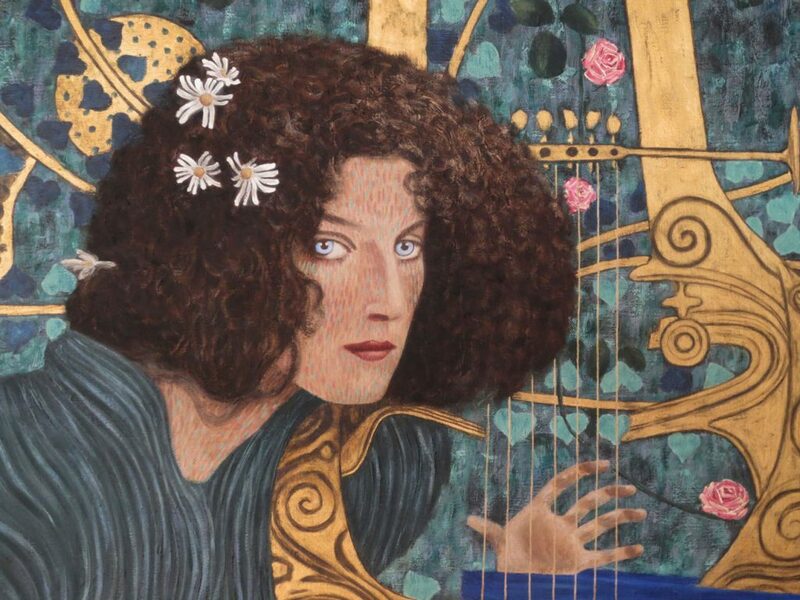 There are some more lost paintings by Gustav Klimt that wait for reconstruction. Not only by Gustav Klimt. The Second World War has claimed art losses beyond imagination. If I only think of the images by Botticelli, Raphael and Rubens in Berlin. But we have to accept that also art won’t last for eternity. Pigments and binders are aging, colours fade away, pictures fall victim to art thefts like the Vermeer from the Isabella Steward Gardner Museum in Boston. However, what has the strongest impact on art is the constantly changing view of the people on it. What is hip today, will be dead already tomorrow, and what is now blooming in the dark might be the next big thing of tomorrow. Important is to enable future generations to look upon the past with their own eyes and to judge by themselves. Art is happening in the mind of the viewer. The idea is what counts, therefore reconstructions can be a valuable contribution. One last word about the situation of art in the world of today. Art is essential to hold a mirror up to society. Art is always subjective, but the tolerance of a society can be objectively measured through it. The present authoritarian developments, the more and more outright censorship attempts and the oppression of dissenters are frightening. Art has to fight against forces that are responsible for the fact that culture needs to be reconstructed at the end. 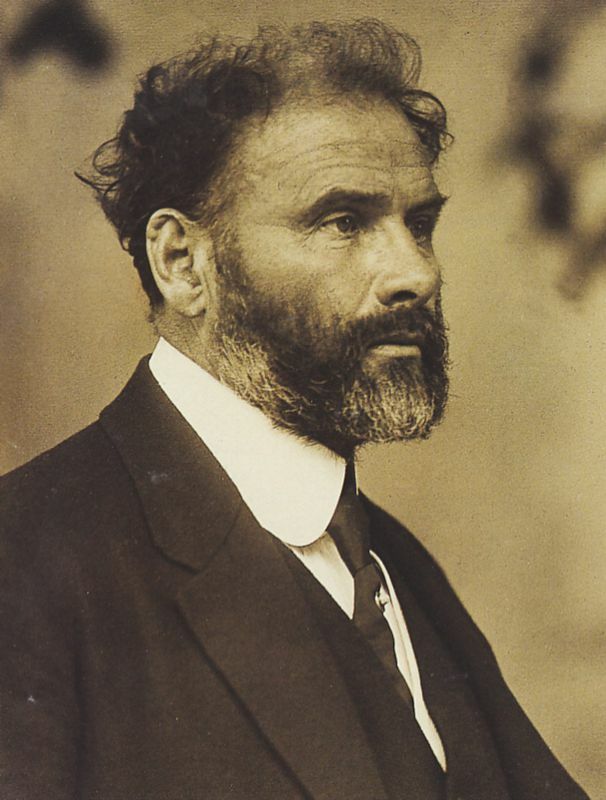 Gustav Klimt died on 6 February 1918, the pictures of Immendorf Castle are missing until today and the inconsistencies during the transport and the arson haven’t been cleared yet historically.